What is a mother? Is she someone who has had a healthy child? Yes, that is one definition. But what about women who have abused or abandoned their children? Should they be considered mothers? What about the woman whose child has died? Is she a mother? I believe that the defining characteristic of a mother is her love. Just like faith and hope, love is an invisible quality but truly the strongest force in the universe – even stronger than hate. In the presence of so great a love as a mother for her child, a broken heart is understandable in the face of tragedy, but love is also the only true healer. Love cannot be killed, lost or destroyed. With the death of a mother and father, the world does not assume the child had no parent at all. The child’s mother is still her mother; her father is still her father. She will always remain someone’s child. Similarly, when a baby dies, the mother remains Mother, even if she may not be able to hold her child or have other children. The absence of her baby does not negate the state of motherhood. Being a mother to a child will always remain a part of her identity. Motherhood is a choice of love, a state of the heart. Even without your baby, your mother’s heart will beat on, strong and true because of the love that lives there. This heartbeat may be translated into compassion for others, the desire to protect and strengthen, grace in struggle, the encouragement of a warm embrace. Let’s start a discussion about the true meaning of motherhood. Here are some characteristics of motherhood that resonate for me. These are traits of mothers no matter whether their children are present in body or in spirit. My point is that a mother’s love lives on as a part of who she is, even after the death of her child. These parts of her that remain are beautiful and worth honouring. Please add more in the comment section below and share with me what you believe makes a true mother. Motherhood is not only a physical state of having children; it is a state of the heart. Motherhood is love. If you have experienced the death of your child, whether from miscarriage, stillbirth, early infant loss, SIDS or any other type of loss, please hold fast to the love in your heart. You are a mother. You are brave. You are strong. You are tender and fragile. Give grace to yourself. Show yourself love. Today, Mother, you are honoured for every part of who you are. Soak it in; let your soul be nourished. You are beautiful. You will survive. Your love has and will make a difference. Also, if you would like to get the free download of the high resolution images to honour bereaved mothers, please click here. Love to you today, treasured Mother. If you want to read my thoughts on Mother’s Day from last year, “Happy Mother’s Day?” click here. You are so right Alexis – motherhood is so many things! When I think if my own mother I would say she was the core, the center, the heart of our family. She was tough and strong yet kind and supportive too. She was the captain of the family ship no matter the weather! I never really thought much about her as a person outside of her role as “my mom” but as we both have aged I see how she has has touched the lives of others in her mothering role! Thanks for your comment Charlotte. I find it so interesting that people can be mothers without a biological connection, like you said your own mother has shown her motherly love to other people. I have had people in my life who were mother figures (including my own much loved Mom). This makes me reason that motherhood is less a physical state and more a matter of the heart. My mother is a mentor! A mentor to you as you grew up? Does she also mentor other people in her life? I guess being a mentor is a part of who she is. Thank you Alexis. Your comment are so thoughtful and inspirational. I will share this blog with other mothers, several whom have also experienced the loss of their child. Thank you, Teresa. I appreciate you reading and sharing. What has it been like from a friend perspective when people close to you have lost a child? I have felt such sorrow, but have been unable to understand the breadth and depth of such a loss (our blog is very helpful in this area). I support their commemorative choices along the way and applaud their efforts to find bereavement groups that offer support of others that have gone through a similar loss. And, we continue to share memories and thoughts of their children as we go through this life dealing with losses of those we love. Yes, we celebrate motherhood (and sisterhood) in all its forms. Thank you Alexis. You sound like a great friend, Teresa. Thanks for this comment – I hope people will get ideas from what you do to support those close to you. Thanks, Bob! I appreciate your kind words. This morning I woke up with great melancholy. It is partly because of the weather and partly because of the date. May 4 is the day society views me as a “real” mother, as today is my daughters 19th birthday. Yet is is also International Bereaved Mothers Day. This also makes me think of my stepdaughter (who we lost at age 18 1/2) and my two boys via miscarraige and stillbirth. I think it does not help that this will be the first year I can not spend with my daughter, as she is away for school. So today I will reflect (a lot) about what it means to be a mother. Thank you Alexis Marie for starting this important conversation. Thank you so much for your vulnerable comment Patti. It sounds like today will be challenging for you for sure. My heart goes out to you. I understand the physical longing to be together. I long like that for Zachary (and my living kids today as I am out of town for work). We are beings that crave contact and touch. Physical absence is tough, whether for a period or a lifetime. I feel the longing for Zachary, missing him as if he will one day come back to me after a long vacation. If only, right? Motherhood in whatever form it is given to us, is a gift of God. It is to be treasured, honoured, cherished, and loved. Treasure the time, as it is fleeting. Honour the gift of the child that’s been given. Cherish the one of a kind child you’ve been blessed with. Love the child unconditionally, as you are loved by God. And in all things give thanks, for we are richly blessed indeed! I agree motherhood is a gift – and our children, even if their lives are short, are gifts as well. I would never change the past to erase Zachary and my pain. His life was a gift, even though brief. 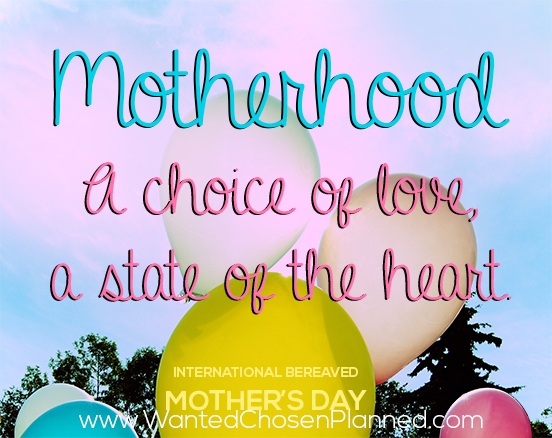 I see you definition of motherhood being applicable still for bereaved moms… It’s just lined with pain and longing. Do you have any encouragement for people who feel angry at God? Alexis, your words are inspiring and amazing. Mothers who have lost children need to be willing to be much more open about their experiences. I feel that if the ‘taboo’ was removed from talking about our losses, we would realize the amount of support that is available for everyone. I am proud and encouraged by all mothers who have lost and are willing to be so open about their experience and what ALL their children mean to them. Thanks for your comment Aaron. Can I ask, what’s your opinion on fathers being open? I am holding you and your family in my heart today.